In our last Ratcatchers blog we took a closer look at Skulk and Pelage. 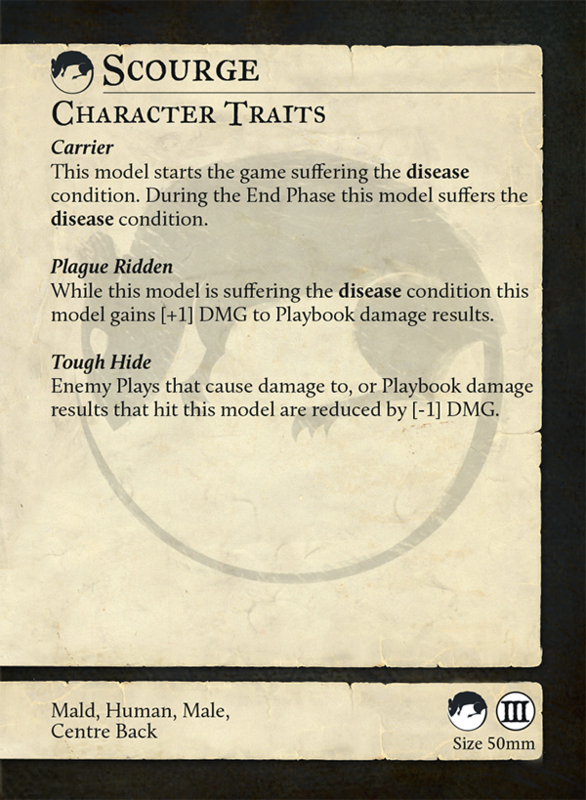 Today though, we’re going to take a look at the player character card for Scourge, the Pestilent Abomination. Scourge takes the role of part tank, part damage dealer within the Ratcatcher’s Guild. He’s quite resistant to damage and can inflict enormous punishment on the enemy with each hit. In that vein, some of the first things you may notice about him are that he has a very impressive TAC , a [2”] melee zone, and a six column Playbook with a monstrous Momentous  damage bolted onto the end. At the other end of his Playbook, TAC  makes a Momentous  damage on the second column, and a Momentous  damage on the fourth column, both quite easily achievable results in a lot of situations. We said that Scourge’s role was part damage dealer, part tank, and oh boy, do both of those roles come across on the back of his card. Let’s get the old standby out of the way first; Tough Hide is a reasonably common rule in Guild Ball. Scourge is so used to pain that he literally doesn’t even notice people hitting him with a wide variety of sharp implements on the Pitch. It’s a great rule for making a model much more durable; coupled with 17 health points and inbuilt healing with Snack Break, Scourge is a monster who’ll need significant focus from the enemy team to bring down. Now let’s get into the brand new rules on the back of Scourge’s card. Carrier is the first of these. Scourge is so infused with disease, so riddled with sickness, so soaked in the pestilence he lives in, that he begins the game suffering the disease condition, and suffers it at the end of each turn if he isn’t suffering it already (if, for instance, you’ve had to use Take a Breather! to clear other conditions). Now obviously, this means that any time he ends his activation, all models within [2”] of him will suffer the disease condition. 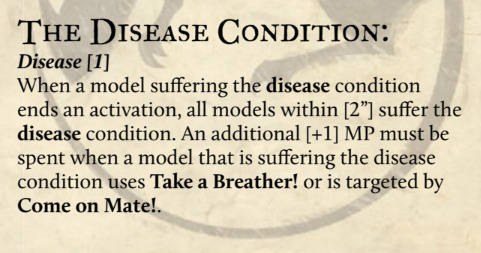 Now it’s important to note that this affects both friendly and enemy models, meaning that your positioning with Scourge has to be careful lest he send disease running rampant throughout your team instead of the enemy! However, given his role of part tank, part damage dealer, he wants to run headlong down the enemy team’s throat and get stuck in the midst of them. Now you can see that while he’s right in the middle of the enemy team, smashing them up and ignoring their feeble return blows, he’s also infecting them all with the disease condition! Which will make it all the harder for them to heal and recover from his devastating blows. Scourge’s final Character Trait is Called Plague Ridden. The effect is simple and powerful; while he’s suffering the disease condition (which is almost all of the time!) he gains [+1] DMG to Playbook damage results. Yep. Go look at that TAC 7 again. Then look at his Playbook. Then think about how hard this man can punch. We’ll wait. Scourge is a brutal brawler, a sickening scrapper, and a man with a face only a melted welly could love. He’s both the toughest model on the Ratcatcher’s team, and the one with the highest damage output AND constantly infects the enemy team with a debilitating disease. He’s truly living up to his hero’s image. Well, that’s all for today folks, we hope you’ve enjoyed this exploration of this vicious, stinking bruiser. Let us know what you think on social media and our forums! Join us again for the next Ratcatcher blog where we’ll be exploring the mysteries of Piper, Devil of the Undercity, the Captain of the Ratcatcher’s Guild!